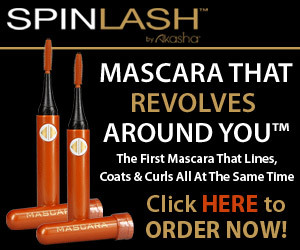 SPINLASH is the first mascara that revolves around you! Through this special offer, you’ll get the SPINLASH, with your choice of black or brownish black mascara, for just $19.99 plus $9.99 shipping and handling! But that’s not all, for a limited time you’ll also get a second SPINLASH with mascara, ABSOLUTELY FREE! This buy 1 get 1 FREE offer is not available in stores.